Victoria (Seychelles) – April 27, 2017 (travelindex.com) – Alain St. Ange stood firm in the face of emerging fake news from the campaign of one of his rivals, which again, like back in January, made unfounded allegations and insinuations bordering on character assassination. 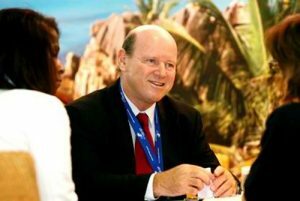 Alain St Ange remains a strong contender among the top 3 candidates for the post of UNWTO Secretary General. The other two are the candidates from Georgia and Korea.St. Ange in communications received over the past two days appears unperturbed and in fact more motivated as he continues to campaign for UNWTO’s top job as Secretary General. A highly ranked source from Seychelles, on condition of anonymity, had this to say overnight: ‘Seychelles exercised her democratic right to field a most eligible candidate for the office of UNWTO Secretary General. We are aware of the constant effort by some news organizations to tilt the playing field in favour of another candidate and that they are willing party to this campaign against our candidate. Alain St. Ange entered the UNWTO race well ahead of most other candidates, where as a matter of fact two of them come from South America. We will not dignify this kind of behaviour of a rival campaign with a response but condemn in general anything less than ethical and of such dubious morals. If Africa fails to capture this post it will be because of such methods which portray our continent badly in the international arena’.Former colleagues and staff of St. Ange also called the allegations absurd with one saying it was this type of cheap politics which gave the entire African continent a bad name. Alain St. Ange, whose campaign slogan is ‘Tourism For All’ earlier in the week said: ‘Tourism is too important to see countries playing politics with this coming election. The economies of so many countries depend on tourism and the livelyhood of millions are also dependent of a consolidated tourism industry’. St. Ange has campaigned to remove all obstacles and discrimination in the tourism industry, a stand which has generated much support from around the world for openly advocating the removal of all barriers for the global travel industry. In addition has St. Ange, instead of throwing mud at his fellow campaigners and aspirants, focused on best environmental practices, sustainability, safety and security, equality, training and cross sectoral interaction being put at the very core of future UNWTO activities. He also vowed to bring non members like the US and others ‘into the fold’ to have all major tourism countries, inbound and outbound, represented at this UN organization. Notably have other candidates not engaged in such deplorable practices and the two South American candidate, while rivals for the UNWTO top job, have remained civil and collegial in their dealings with each other’s campaigns.